At the Paul N. Elbin Library, we asked students, staff, and faculty to sign an expression of condolence document. The Student Government Association joined in to gather signatures. Our Campus Security staff began a "Stop a Cop" campaign, asking those interested in signing to come to them -- they carried clipboards while making their rounds. 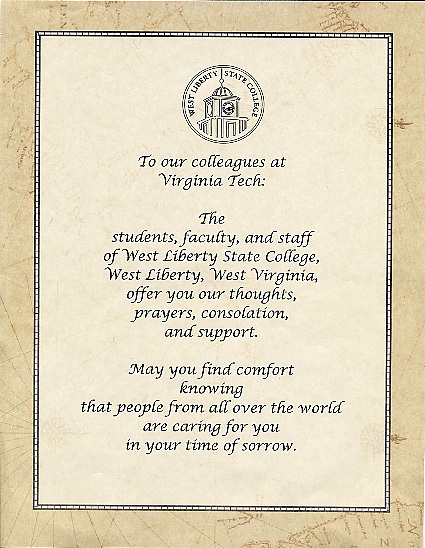 We are a small school, but we have mailed our sympathy roster to VT, with 500 signatures. 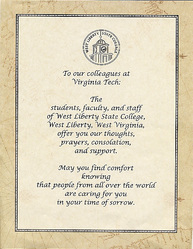 The irony is that VT&#39;s tragedy has brought our campus closer together. We are truly sorry for your great loss. Ted Nesbitt, “From West Liberty State College [WV] to Virginia Tech,” The April 16 Archive, accessed April 23, 2019, http://april16archive.org/items/show/82.